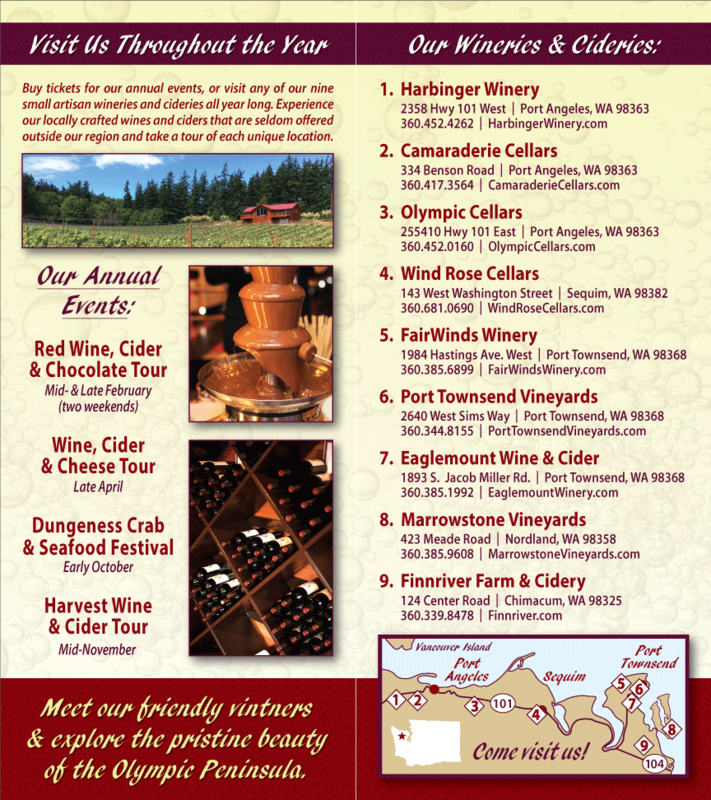 Olympic Peninsula Wineries invite one and all to the 2011 Harvest Winery Tour, November 11 – 13. This is a wonderful opportunity to taste Washington State wines and ciders created on the Olympic Peninsula. Visit eight wineries over the course of three days, tasting and comparing as you go. There is an art to wine tasting. Vintners and sommeliers work hard to create flights that will highlight the flavors of different vintages and varietals. An event such as the Harvest Winery Tour allows participants to explore Washington State Wines in depth. It is simply not to be missed. Vertical wine tastings explore one varietal in depth. During the upcoming Harvest Winery Tour of Olympic Peninsula Wineries, Olympic Cellars will be offering vertical tastings of their Syrah and Cabernet Franc; 2007, 2008, and 2009 vintages will be poured. This is a great opportunity to explore how different elements, such as weather, can effect a vintage. Horizontal wine tastings explore wines of the same varietal and vintage but from different wineries. Folks participating in our 2011 Harvest Winery Tour may create their own horizontal tastings as they go. Better yet, buy a few bottles along the way, and host a horizontal wine tasting back at home, with friends. Wine tasting is almost always available at the Washington State Wineries on the Olympic Peninsula. Many of the wines we make are created in relatively small batches and can’t be found on the shelves of every supermarket. We’re thankful for events such as the Harvest Winery Tour, which allow us to pour and share a variety of our wines. Since this is a harvest festival, there will also be food. Each winery will have appetizers as well as wine. These tasty treats should highlight the wines served. Please see our 2011 Harvest Wine Tour page for more details.